Kevin Merrigan at Northrop & Johnson sends in news of a $3.5 million price cut on his listing for sale, the 51.2m motor yacht Gallant Lady. Gallant Lady was built by Dutch superyacht yard Feadship and delivered in 2007, fitted with a host of eco-friendly innovations specified by her environmentally conscious owners – including a bio-reactive waste sewage treatment plant. The use of high-tech lightweight materials in her construction gives her a very shallow draft compared to other yachts of her size and quality, increasing her cruising capabilities. British designer John Munford designed her interior, influenced by eighteenth and nineteenth century French and Italian antiques. She showcases beautiful woods ranging from black walnut, sycamore, eucalyptus and myrtle burl. Amazing glasswork artfully combined with no fewer than seventeen granites and marbles creates a feel of romantic elegance. Custom-made Edward Fields carpets and silk panels accentuate the luxurious textures found throughout the yacht. Accommodation is for 10 guests in five well-appointed staterooms laid out as a master suite, VIP stateroom, a double and two twins and all staterooms have en suite facilities. Twin 1,000hp Caterpillar engines give her a range of 4,200 nautical miles at 12 knots. 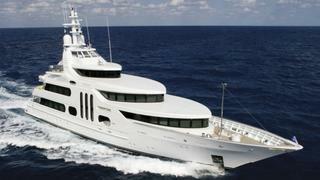 Lying in Fort Lauderdale, Florida, Gallant Lady is down from $42.5 million to $39 million.